This long-exposure photo by Roberto Porto shows the bright arcs of star trails and a bright Quadrantid meteor in the predawn sky over Tenerife in Spain's Canary Islands. A dazzling display of "shooting stars" kicked off the 2012 skywatching season early Wednesday (Jan. 4), thrilling amateur astronomers around the world with views of the Quadrantid meteor shower. Usually one of the most dependable meteor displays of the year, the Quadrantid meteor shower peaked at about 2:30 a.m. EST (0730 GMT) in a brief, but eye-catching, light show. Quadrantid meteors are the leftover crumbs of a shattered comet that broke apart centuries ago, NASA scientists say. To mark the meteor shower, SPACE.com invited readers to send in their photos of the event, and you answered in spades. From light-polluted cities to remote islands, skywatchers reported spotting some dazzling views of Quadrantid meteors. On Tenerife, the Quadrantids display peaked close to sunrise (local time), "so the peak was [awash in] twilight," Porto told SPACE.com in an email. "Also, the weather predictions were for high clouds this night, [but] we managed to capture a couple of genuine meteors." Tenerife is a volcanic island and home to Tiede, the highest mountain in Spain. Porto's photos show Quadrantid meteors streaking over Tiede and other peaks, with dark rock formations setting the scene. According to the skywatching website Spaceweather.com and the International Meteor Organization, this year's Quadrantid display peaked at about 80 meteors an hour. This reporter spotted three meteors within a 20-minute period of observing from West Orange, N.J., before the frigid winter night forced a retreat back inside. In Florida, skywatcher Richard Hay was more resilient. "My wife and I ventured out into the frigid 26-degree Florida night this morning to catch the shower with our own eyes and were rewarded with about 20 or so bright Quadrantids over a 90-minute period," Hay wrote in a blog post. In Ozark, Arkansas, skywatcher Brian Emfinger reported seeing several meteors that — while not especially bright — were still impressive. 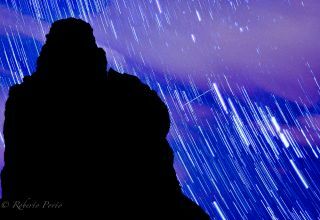 Emfinger combined his observations into a great recap video of the 2012 Quadrantid meteor shower. "I caught one nice Quadrantid Earthgrazer that shot across much of the sky, but it wasn't super-bright," Emfinger told SPACE.com in an email. "It did leave a trail that was visible for about 15 minutes." Earthgrazers are meteors that occur low on the horizon, and can sometimes light up in dazzling fireball displays. Unlike some of the more well-known annual meteor showers, such as the Perseid and Geminid displays late in the year, the Quadrantid meteor shower's peak lasts only a few hours. The Quadrantids and Geminids originate from the asteroid 2003 EH1, which astronomers suspect was once part of a larger comet that broke into pieces several hundred years ago. The small space rocks that become Quadrantid meteors hit the atmosphere at speeds of about 90,000 mph and burn up about 50 miles above the Earth, creating dazzling fireballs. The Quadrantid meteor shower is named for the constellation Quadrans Murals (or Mural Quadrant, which was an early astronomy tool for observing stars), a pattern first observed in 1795 by the French astronomer Jerome Lalande. The Quadrans Murals is located between the better-known constellations of Bootes the Hersdman and Draco the Dragon. Editor's note: If you snapped an amazing photo the Quadrantid meteor shower or any other skywatching sight and would like to share it with SPACE.com, contact managing editor Tariq Malik at tmalik@space.com.